While I am co-chair of the VA Hospital scarves and hats project, where we now have commitments for 64 hats and scarves, I am just a helper bee for the VA Hospital Nursing Home Quilts Project. Truthfully in general I'm a worker bee. In the working world I used to inhabit, I turned down promotions because I am not management material. I was a manager once. Hated it. But I digress. What I'd like to do in this diary is give some suggestions for simple quilts that look nice. I'll be focusing on three patterns with variations on them. This is the most basic quilt. Last year when we only had 3 weeks to do a quilt for the VA Wheelchair project, this is the pattern we chose -- 6" blocks. 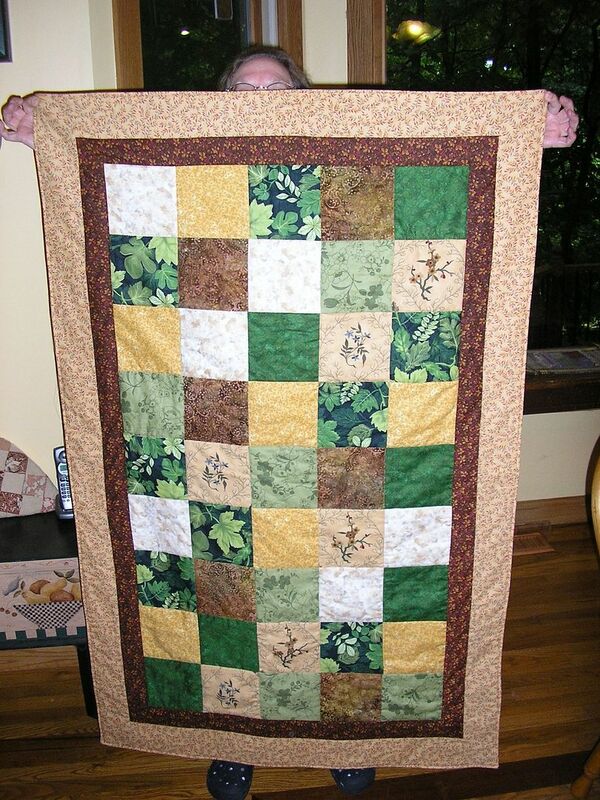 You can do it as a "scrappy" quilt, but we wanted a color pallet of green, gold, brown and beige with strong aspects of plants. Soothing. The end quilt is below. Although this has a defined pallet and similar motifs, it was in some respects a scrappy quilt as some of these fabrics I had enough to add to this quilt, but not enough fabric to do much more with it. Nine-patch quilt blocks contain nine equal squares. The squares are arranged three rows across and three down usually with some strong contrast in color. So basically 1st row: light, dark, light; second row: dark, light, dark; third row: light, dark, light. Or the reverse. The nine patch can be alternated with a single larger patch. An example is below. 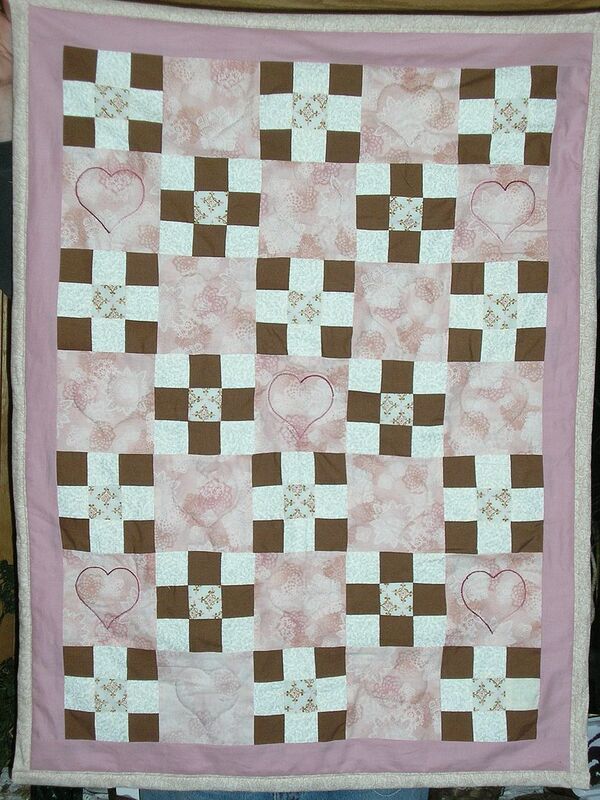 This is one of the first quilts I made. It was a baby quilt for a friend. The nine-patch is alternating with a single patch that has a heart embroidered in it using variegated red thread and cream thread. In this case the center block is different, but it wouldn't have to be. 9-patch can be combined with other types of squares as shown below where a 9 patch is combined with a half square triangle. This was part of a first Saturday project. Or here is a quilt square I made for the Okiciyap food pantry quilt with a 9 patch orientation and again half square triangles. One of the easiest way to do a series of 9 patch squares is by sewing strips of fabric together and then cutting them and assembling them. To be more specific, say you wanted a 9 patch square that would finish at 6 1/2", you would need 2.5" strips, which would finish at 2" squares with 1/4" seam on each side. Three 2" squares would give the 6" plus the 1/4" on each side for the seam. To begin, cut two strips of the lighter material 2.5" wide and, say, 27" long or width of fabric, whichever you are comfortable with. Cutting long strips can be a bit tricky sometimes. Then cut 1 strip of the darker fabric 2.5" wide and 27" long. Sew the strips of fabric together, light, dark, light using a quarter inch seam. Now slice that 3 fabric strip into rectangles that are 2.5" wide by 6.5" long. Next cut 2 darker strips 2.5" wide and 27" long and 1 light strip 2.5" wide and 27" long. Sew them together, and again slice them at 2.5". Assemble them into the blocks so the light and dark block alternate. This may seem complicated, but it isn't. This process is shown more graphically here. Or you can use 5" charm squares which are precut and sew them together alternating light and dark fabrics. That is shown here. There are lots and lots of ways to do half square triangle blocks. I went through some of them in an earlier diary here. The most basic way is to cut 2 pieces of fabric 7/8" wider than you want the finished square -- so for a 4" finished square you would cut the fabric 4 7/8" wide. Place the two fabrics on top of each other. Draw a line, corner to corner, then a second set of lines 1/4" to each side of that first diagonal line. Sew on those two lines that are 1/4" off the center line. Cut apart; press to the dark side. Or you can use any of the other methods I describe in the earlier diary. For most quilters this isn't a question: they always bind. 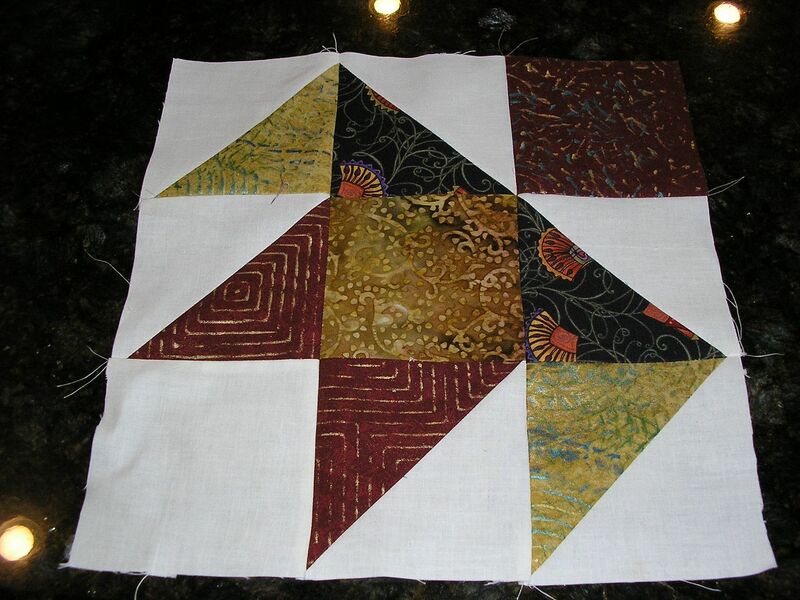 However, binding can be intimidating for a beginning quilter. A quilt doesn't have to have binding to be a quilt. How to finish a quilt without binding. You can use spray adhesive, or adhesive backed batting, adhere the batting to the front, put the backing on top -- so you have a sandwich of batting, quilt top good side down and then backing good side down on top of the quilt front. 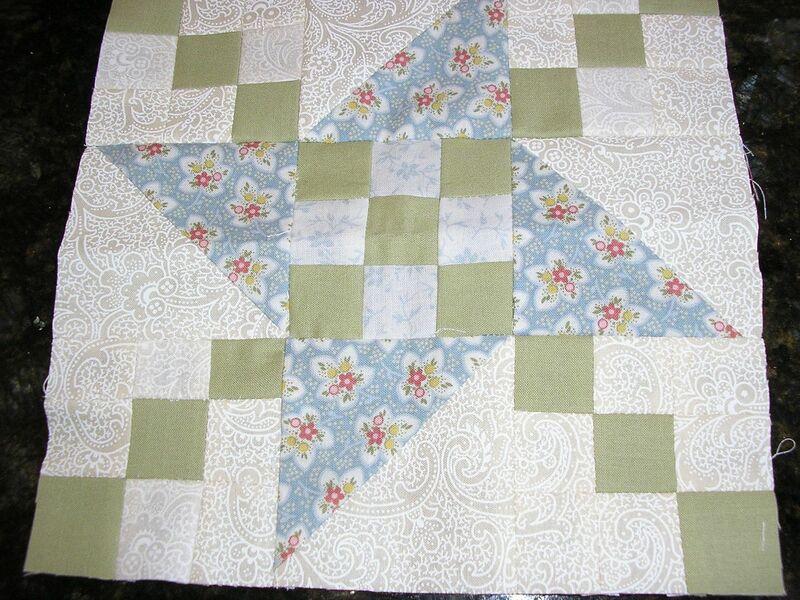 Sew around 3 & 3/4 sides, turn right side out, clipping the corners close and then top stitch around the whole quilt. A quilt without binding is just a thought if a new quilter is too intimidated by the whole binding process. And what are you quilting now?